MI Audio make some awesome amplifiers under their MI Amplification brand, and fantastic pedals under their MI Effects brand. Their latest pedal release is a high gain distortion pedal based off their monster Megalith Beta high gain amplifier. It is appropriately called the Megalith Delta. Check out the details below. This sounds like it is going to be one hell of a distortion pedal! “The Megalith Delta high gain distortion pedal design came from years of R&D of our MI Amplification high gain amplifier, the Megalith Beta. It took some time for me to really understand the variables behind great high gain tones. But by designing the Megalith Beta amplifier from the ground up, I was able to really grasp how to make a complex, sophisticated high gain sound that kept all the nuances, huge bottom end and the clarity and character of the top end”. MI Effects are excited to announce that the Megalith Delta high gain distortion pedal is ready to hit the streets on the 8th June. This highly anticipated pedal will change the perception of high gain effects. Here at MI HQ, we have spent twelve months refining and tweaking the pedal design, to produce a high gain distortion pedal like no other. For those of you unfamiliar with the Megalith design, it all started on the back of our very popular, and brutal, MI Amplification Megalith Beta amplifier (http://miamplification.com/MLB.htm). The 180W monster of an amp was designed to provide a sophisticated and complex high gain sound, ranging from clean to extreme high gain and all tones in between. What makes the Megalith Delta high gain pedal so unique is that it was designed by the same designer of the amplifier, Michael Ibrahim. Every nuance and design detail that was placed in the amplifier has been taken into consideration with the Megalith Delta, finalising in one of the tightest and aggressive stompboxes on the market. The Megalith Delta is a valve-like, JFET (transistor) interpretation of the Megalith amplifier providing the huge bottom end, ­along with the character and clarity of the top end that signifies the Megalith name. Not only has the preamp been painstakingly recreated, but the interaction of the power amp and phase inverter has also been considered to create a high gain sound unheard of in pedal form. 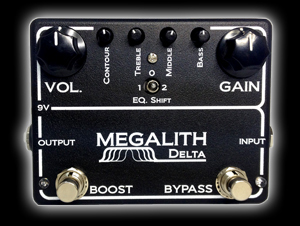 The Megalith Delta pedal has the same structure as if it were another channel of the Megalith amplifier. What makes the amplifier stand above the rest is its incredibly flexible EQ section that allows the user to dial in every shade of brutal metal and hard rock that transforms your clean channel into a monster of high gain proportions. The three position EQ SHIFT SWITCH is a unique feature of the Megalith’s tone controls. This switch shifts the EQ’s bands, allowing you to control different frequencies. Coupled with the powerful THREE-BAND EQ, the tone shaping possibilities are extremely impressive. Perhaps the most unique feature on any gain pedal is the CONTOUR control. In the Megalith Beta amplifier, it affects the frequency response of the phase inverter in the power amp, and the CONTOUR control in the Megalith Delta pedal mimics this exact response. Fully clock-wise, it’s old-school; fat and midrangy, with a slightly rolled off top end. Turn it counter-clockwise and the mids start to scoop out, and the sub-bass frequencies tighten up – the hallmark of a modern high gain sound. …and if this wasn’t enough, a footswitchable GAIN BOOST simulates the feel of switching from mid-gain mode to high-gain mode as in the Megalith Beta amplifier, and provides added upper mids and tightness giving you extra harmonics and saturation. A side-by-side shootout between Megalith Delta pedal and Megalith Beta amp is one that has impressed us all in the workshop, and we know it will impress our potential customers. Stay tuned for the video demo! This is the most thoroughly developed design in the history of MI Effects and we can’t wait to hear the feedback from the public. MI Audio make some amazing gear, and I for one am dying to try this pedal out!